We all know that a mechanical computer was invented by Charles Babbage (he is considered as father of computer) which eventually led to more complex designs. From the initial stages any computer mainly used to increase productivity and make our self pretty comfortable by using Technology which are mainly focused on the business needs. 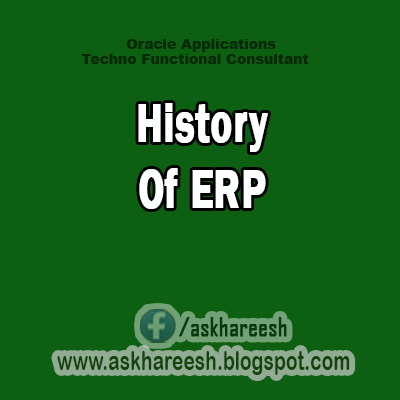 Even from the early development of the computer or computer software, ERP software was mainly addressed. First development of this kind of software was in 1960′s and it was able to manage demand and ordering when needed and not a scheduled one. So, later in 1970′s a newer version was into picture which manages the demand and ordering on a timely schedule and was used for planning too. By including solution for financials and account management of a business process, the software became more and more popular. Later this systems evolved into ERP’s, which offers a complete solution for integrated for financials, people, resources, inventory, etc. into almost everything. In 1960′s software main focus was towards manufacturing systems which was named as Inventory Control. Most of them were designed to handle inventory based planning and scheduling for materials which are based on traditional inventory concepts. From 1970′s the focus was inclined towards Material Requirement Planning(MRP) Systems that were built on Master Schedule concepts (for Company’s Finished Goods which they would sell directly) by dividing them into Sub-Assemblies, Components, Raw Materials, Planning and Procurement. These systems were pretty Expensive, cumbersome and require highly skilled labour in huge number to support the Mainframe Computers. SAP was released its first version into the market in 1972 in Germany from the work of five engineers from Mannheim. This software was very helpful in integrating the business solution as per Market requirements and standards. There was another firm that was released a software in 1975 by John Cerullo, Bill Lawson and Richard Lawson named Lawson Software which was the first pre packed enterprise technology. It was a good alternative to customized business software applications in the Market. From then MRP became a fundamental concept in Controlling and Managing the production. Baan Corporation which was evolved in 1978 by Jan Baan which provided administration and financial consulting services. In the Mean time in 1979, Oracle has released its first commercial SQL RDBM System in the Market. In 1980′s MRP-II(Manufacturing Resources Planning) was evolved which extends MRP to Distribution management and shop floor activities. This mainly includes a new method of coordination between manufacturing processes with in all the stages from Planning, purchasing, inventory control till product distribution. All the companies following the better process of planning, production and distribution led to better profits and higher ability in the market. At the same time in 1981 Baan released its first software product with Unix as its operating system. Again in 1990′s the software product was extended to cover various other areas of business in both service and manufacturing processes like Human Resources Projects Management, Contracts, Financials, Engineering and many more to fulfill the complete end to end business processes at any enterprise level. When we think that each business area as a module then, this software integrates well with different modules in the system. Thus this software addresses even much complex scenarios by using multi module applications. This software improves business processes, ability of resources and saves lot of valuable time. Enterprise Resource Planning(ERP) integrates all the resources and plan them accordingly for better business process of an Enterprise. And currently we are in ERP-II which provides solution very complex functionality. These ERP system should also have a better Hardware. Each business has its own needs and so as an enterprise. So, An ERP is a packaged business software system that lets a company automate and integrate the majority of its business processes which share common data and practices across the enterprise. It helps to produce and access information for a real-time environment.